As part of the BurgerTime cabinet repair I undertook, I needed to remove everything that was affixed to the bottom panel of the game so the panel could be replaced. 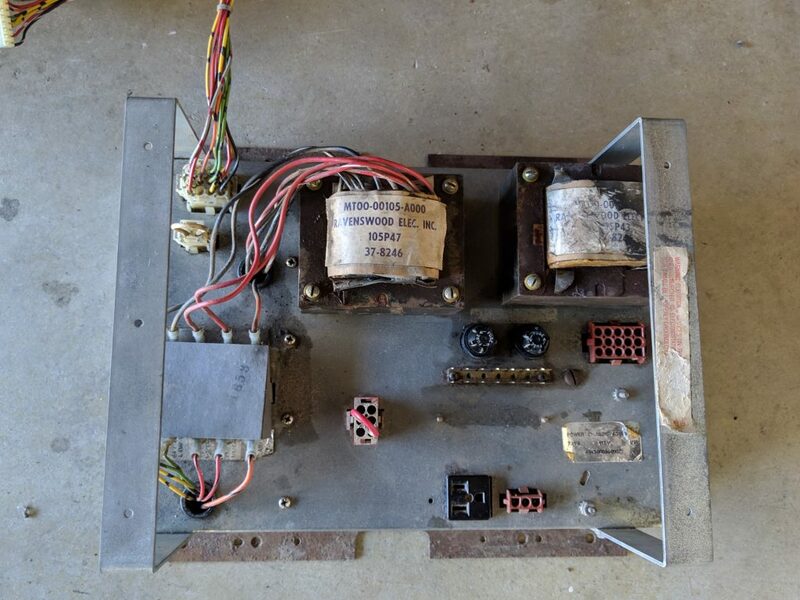 This included the original power supply unit, which was screwed to the bottom of the cabinet as well as a switching power supply that was added sometime later to power the game board when the original power supply stopped doing so properly. 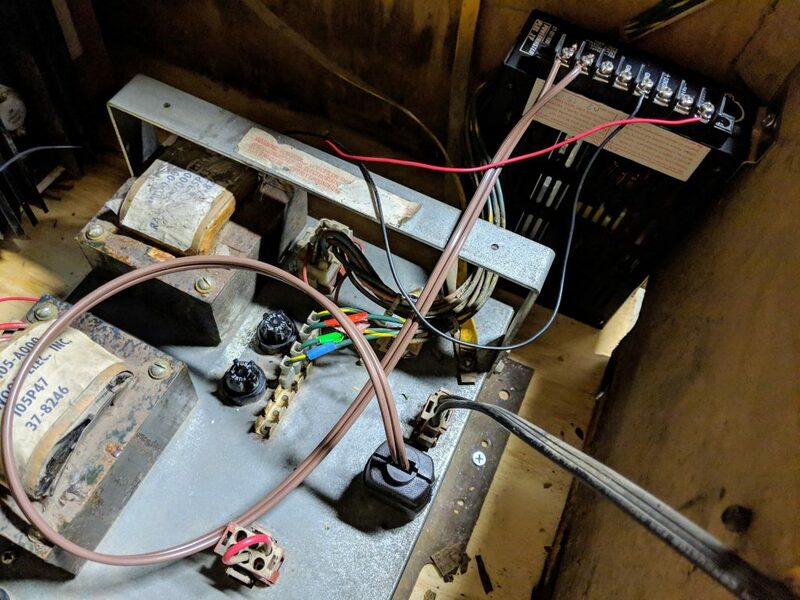 It is usually a good idea to retrofit these old arcade games with a more modern, switching power supply to power the game board as they tend to be more reliable and a lot less likely to fry the board when they fail. That said, the manner in which this “aftermarket” power supply was installed was pretty abhorrent. 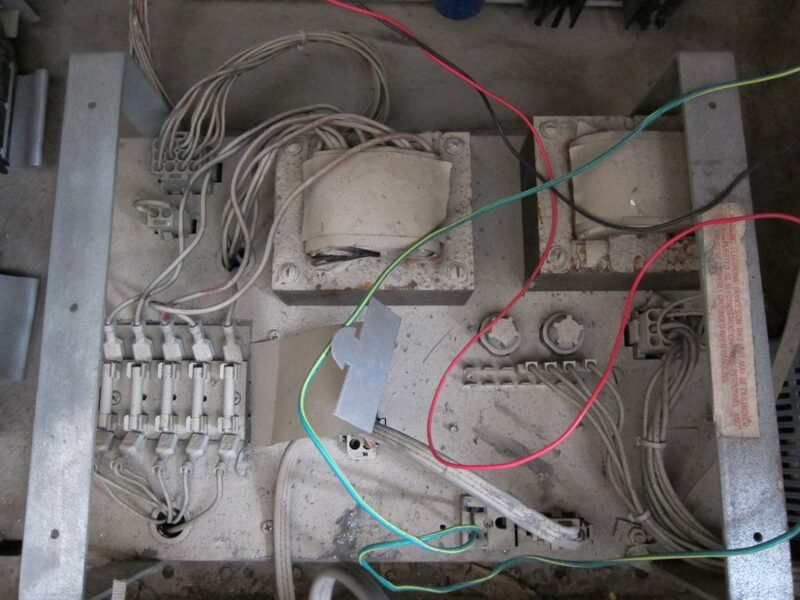 First, the power supply unit itself was not actually mounted to anything — it was just laying on the bottom of the cabinet. This can create all kinds of problems when you go to move the unit, especially if you need to tip it or lay it down. You really don’t need a 3 pound hunk of metal bouncing around the inside of your game system. Next was the manner in which the installer decided to power the new power supply. 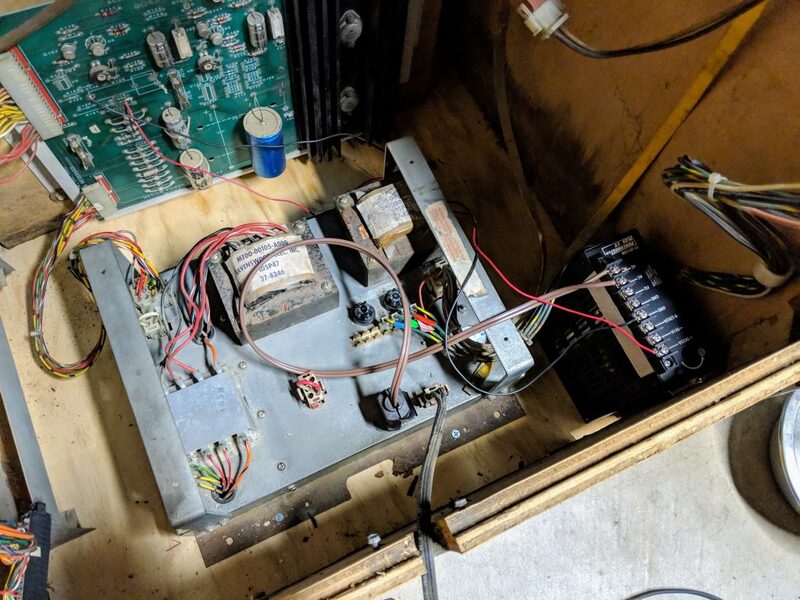 As noted, installing a switching power supply into these older games provides the benefit of supplying more reliable direct current (DC) to the power sensitive, digital game boards. The original power supplies were actually pretty bad at doing that through a step down transformer and over time would the DC signal could degrade to the point of actually damaging some of the components on the game board or even the board itself. Switching powers supplies, on the other hand are a much more modern approach to converting AC power to DC power and do a better job of providing a more filtered and consistent current. 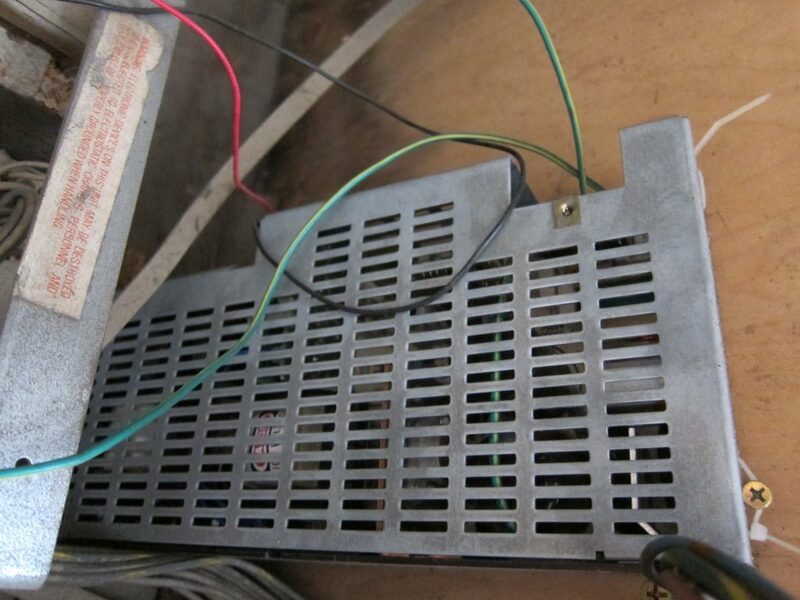 The problem is that the switching power supply is not able to power other elements in the game system, most notably the monitor, so the original power supply must be maintained in some fashion to do that job. That’s what we have with the BurgerTime system. The original power supply appears to be properly working and even has an auxiliary power outlet on it to plug in another AC device. 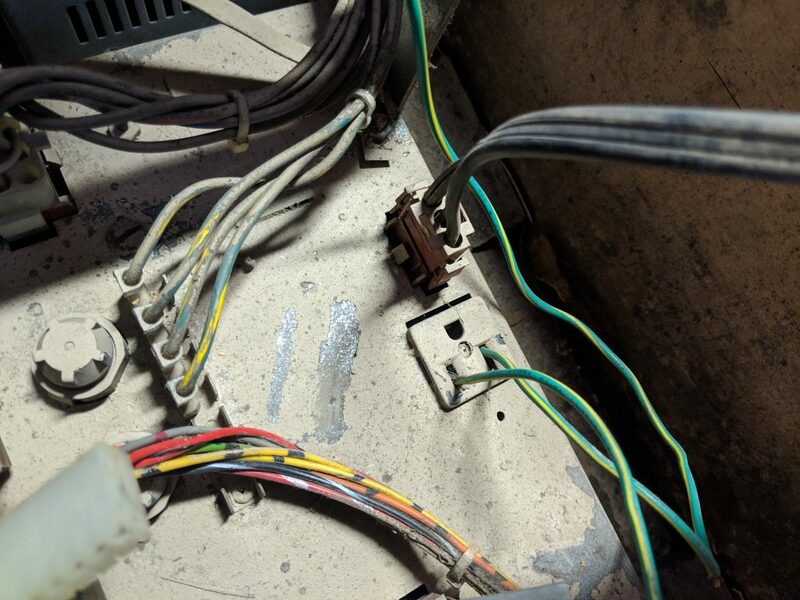 Rather than build a proper power receptacle for the switching power supply to tap into the auxiliary outlet, whoever installed the unit simply decided to shove the AC leads from the switcher directly into the auxiliary outlet. I guess it works, but its not very stable and looks like crap, so the first order of business is to build a proper power cord for the switching power supply to plug it into the auxiliary outlet. I picked up a 5 ft length or brown lamp cord and a brown, 2 post plug assembly from Home Depot for about $5 total and assembled the plug for the switching power supply. Since I had it out of the cabinet, I decided to test the power supply to make sure the power levels were within correct tolerances. Good thing I did, because the +5V post that was being used was not registering any voltage at all. The unit was definitely an older one and did not sport a pot to adjust the voltages, which can often degrade as the unit ages. Basically, the supply was toast! Fortunately, I had a spare switching power supply and tested the +5V lead on that unit and it tested fine. Before I set about re-wiring everything I decided to give the original power supply a good cleaning. I just used a little soapy water with a toothbrush to scrub off the 30 years of muck that had collected. The results were pretty good. Once the original power supply was cleaned up, I put everything back in the cabinet and wired things back together. Everything went in without a hitch. Now all that’s left is to power the system up and make sure everything is working. The unit powered up correctly and the game display came up but, unfortunately, there was a problem with the display — the screen image was rolling right to left. I was hopeful this would be a simply monitor adjustment to the horizontal hold. Unfortunately, it didn’t quite work out that way.